When you really think about it, laundry takes a very long time. 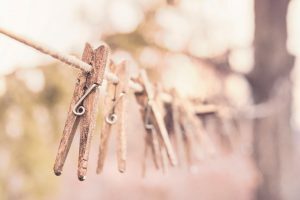 With the entire process taking about 8 hours a week, it makes sense that we often allow our dirty clothes and sheets to pile up and over the hamper until we’ve used our last pair of clean socks. You’ve probably gotten used to the piles and baskets. You’ve learned special deodorant tricks, and you’ve probably worn dress clothes because your favorite jeans were dirty. You’re a busy person. We get it, that’s why we want to help. Here are five reasons why you should forgo the piles and switch to Laundry Magician’s pickup and delivery services today. We’ll Save You Time: Time is money. Instead of wasting the equivalent of a quarter of the work week on sorting and folding your laundry, why not paint, or go for a run, or watch TV? We Love Your Quirks: Maybe you still use the same detergent your grandma did, or maybe you have to hold your items in just the right way. Whatever it might be, we can do it too! When you sign up for our services, you’ll be able to schedule a pickup time that works for you and indicate any personal preferences or special accommodations that you may have. One Less Thing To Worry About: Being an adult carries lots of responsibilities and even stresses. When we take care of your laundry, you’ll be able to focus your energy on another task at hand. You’ll Have Clean Clothes: That’s the goal, right? Clean clothes and blankets. Gone are the days where you have to body slam your closet door shut. Now, you can wake up on clean sheets, and put on freshly pressed clothes. Out the door, you go!